In the February 2017 issue, we highlight the following honors and recognitions. At the annual Oregon State University Extension Association (OSUEA) conference, the Benton County Health Department’s School Health Navigation team received OSUEA’s Search for Excellence award for “Get Outdoors Day.” The OSUEA Search for Excellence program recognizes outstanding education effort, innovation and impact. Get Outdoors Day is a one-day learning event held each spring at Peavy Arboretum, north of Corvallis. This free, family-friendly event encourages recreating outdoors in a nearby forest and to learn new healthy lifestyle skills in a safe, welcoming atmosphere. Designed to attract mid-Willamette Valley residents, Get Outdoors Day focuses on breaking down barriers of participation (language, food, unfamiliar atmosphere, transportation) for underrepresented communities. Today’s American kids are less connected to the outdoors than any previous generation and research shows that kids are spending half as much time outside as they did 20 years ago. “In Benton County, 35% of adults are overweight, including 21% classified as obese and among eighth graders, approximately 12 percent are overweight and 7 percent are obese,” said Viviana Gonzalez, School Health Navigator at the Benton County Health Department. Get Outdoors Day has been held every spring since 2013. 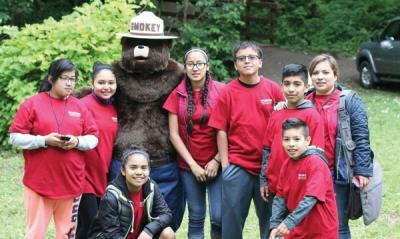 The event has been a local success with an average of about 570 mid-Valley residents participating each year, about a quarter of which are non-white and for whom English is a second language, and 60% are new visitors to Peavy Arboretum. The next Get Outdoors Day is scheduled for Saturday, Jun. 3, 2017. January 2017 marks the four year anniversary of Benton County’s tobacco-free facilities and grounds policy. This policy prohibits smoking, vaping or other tobacco use indoors or outdoors on Benton County property. The policy seeks to promote the long-term health and safety of county employees and the public by promoting a tobacco-free environment. Benton County has been in the forefront of tobacco control policy adoption and helped pave the way for current state laws prohibiting smoking in almost all Oregon workplaces and prohibiting the sale of e-cigarettes to minors. Benton County commission chair and longtime community volunteer Anne Schuster received the First Citizen Award for leadership and performance for work above and beyond her profession at the 69th annual Celebrate Corvallis event. The First Citizen Award honors individuals between the ages of 42 and 65 that participated in a broad scope of activities centered in the Corvallis area for more than three years. Former Benton County Commissioner Jay Dixon received the Jim and Ruth Howland award for special achievement at the 69th annual Celebrate Corvallis event. The Howland award, named for Jim Howland, one of the founders of CH2M Hill and his wife, Ruth.